These tour names do not guarantee a stop to each of these countries, so check the cruise itinerary before booking. Remember you’ll need to rest. 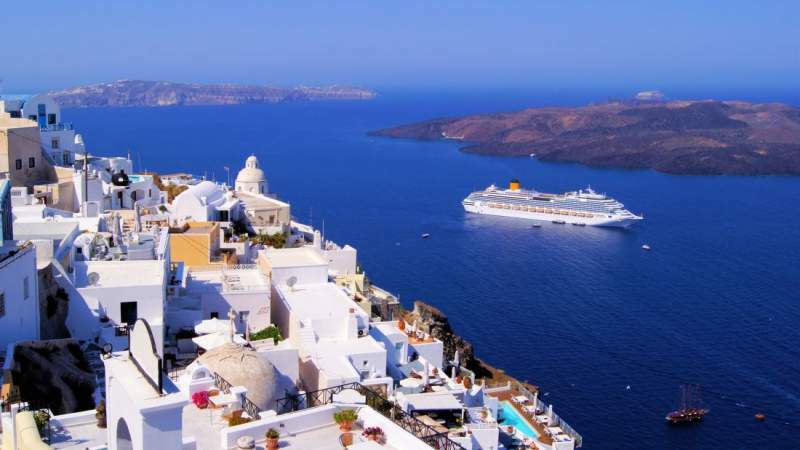 When booking tickets, it can be tempting to find a cruise that stops each day in a port, but by the end of the cruise you can be exhausted from all the sightseeing. Try to find a cruise that has one full day at sea for you to recover and prepare for the next port. Plan for the proper season. Unless your cruise options are limited to a certain time frame (school holidays or special occasions) it pays to consider the different seasons to visit Europe. If you travel in June-August, be aware that there will be lots of other visitors during this time. If you hate crowds, consider booking a cruise during the late spring or early fall months for a warm vacation with less company. Prepare for a short stay in each city. Due to the nature of cruise travel, you will likely only spend one day in each major port of call (the port your cruise will visit). You will get a great view of the country from the ship, but only having one day on land will change your plans for sightseeing. Look up the best of each city, and head straight there when the ship arrives. Europe is famous for its cobblestone streets, and as a visitor, you’ll spend much of your time on land walking. Your main mode of transport for sightseeing and for getting to different attractions will be your feet, so make sure they are well dressed for the trip. If you don’t live a very active lifestyle during the year, take a daily walk for a month before you leave. This allows your body to adjust to the amount of activity before you arrive in Europe. If you’ve gotten your fill of acting like a tourist, pick one or two ports to live locally. Head for a smaller town, purchase lunch from a grocery store, and enjoy a day in the park. You can get a feel for the local culture and get a break from the hustle and bustle of major cities. You’ll also find more distinct souvenirs in small shops than you will on the streets near the port’s main attractions. While it’s easy to get caught up in the excitement of the next destination, spend some time on board making connections with your fellow travelers. You’ll meet people from all over the world and form lasting relationships. Plus, if you make a new global friend, it gives you an excuse to go visit them on your next vacation. Take advantage of the options for rest and entertainment on the ship. Most of the special options of your cruise ship will be advertised in advance: spa treatments, pool, special adults only area to escape the noise that comes with children, and even nightclubs are available on most ships. Explore the ship on your first day to get a feel for your new home, and do some extra research to find out the extra perks that may not be advertised. For some ships, the “required” dining times are merely suggestions, and you’re free to dine whenever you’d like and avoid the masses during meal times. Stay connected with your group. If you’re traveling with kids or a large group, use walkie talkies to stay connected without worrying about international cell phone rates. You’ll be able to reach each other on the ship and in port with some walkie talkies boasting a 20-30 mile range. Along with the essentials (swimsuit, passport, sunscreen, good walking shoes) you’ll want to prepare for some changes in weather over the course of your trip. Dress in layers and bring an extra, lightweight layer with you when you depart the ship. Having a small rain cover that fits in your day bag will make a huge difference when that last minute downpour makes its way through your port of call. Make sure you account for bringing home extra souvenirs and gifts when packing. You can bring a compact laundry bag to hold dirty clothes outside your suitcase, making room to hold all your treasures when it’s time to head home. If you don’t have time to keep an extensive travel journal, try to pick up a postcard in each city you visit. When you return to the ship, you can jot down a few great memories of the day. By the end of your trip, you’ll have a postcard album of your entire cruise. While you’re enjoying your cruise, think about whether you’ll be taking another one soon. Many tour companies will offer a large discount on the ticket cost of your next cruise if you book while on board. If you started on a Mediterranean cruise, take the opportunity to book a ticket on a European river cruise. Take advantage of this offer to set yourself up for your next adventure. With these 12 tips, you’re on your way to planning a European cruise that will change your life. Experiencing new cultures and sights while staying in the same cabin each night brings you the adventure of backpacking through Europe and the comfort of staying at a resort for a week. Enjoy the best of both worlds on your European cruise.